Please read this carefully. By accessing the web sites owned or controlled by EmCan Media (the "Sites") you are agreeing to our terms and conditions set out below, whether or not you register as a user. If you do not agree to these terms and conditions of use, please do not use the Sites. The Sites are owned and operated EmCan Media ("EmCan"). As a user, you will be able to access material on most areas of the Sites without going through the registration process. EmCan reserves the right to suspend or terminate your access and use of the Sites (in whole or in part) at any time in its sole discretion without notice. All material on the Sites (the "Content") belongs to EmCan, or its licensors, and save where otherwise specified users should assume that all content is owned by EmCan. No material from the Sites may be copied, reproduced, republished, uploaded, posted, transmitted or distributed in any way, and may only be used for your personal, non-commercial use. Modification of the Content or other prohibited use of the Content is a violation of EmCan's copyright and other proprietary rights. All trademarks, service marks and trade names on the Sites are proprietary to EmCan or its licensors. In particular, but without limiting the above restrictions, may not do any of the following without prior written permission from EmCan:- Redistribute any of the Content (including by using it as part of any library, archive or similar service); Remove the copyright or trade mark notice from the Content; Create a database in electronic or structured manual form by downloading and storing all or any of the Content. You may not create any link from or to our Sites without EmCan's prior written consent. On registration, you must provide EmCan with accurate, complete registration information and it is your responsibility to inform EmCan of any changes to that information (including in particular your e-mail address) by using the edit details function available on the websites to which you are registered. Each registration is for a single user only. On registration, you should choose a user name and password. EmCan does not permit any of the following:- any other person sharing your user name and password; or access through a single name and password being made available to multiple users on a network. You are responsible for all use of the Sites made by you or anyone else using your user name and password (collectively, "ID") and for preventing unauthorised use of your ID. If you believe there has been any breach of security (eg the disclosure, theft or unauthorised use of your ID or any payment information), you must notify EmCan immediately. If you use links from the Sites to an authorised connected site not operated by EmCan to download software from the Sites or any other material, files, images or data, you acknowledge and agree that EmCan has no responsibility in connection therewith, and does not transfer title to you. The Content is for your general information and use only and is not intended to address your particular requirements. In particular, the Content does not constitute any form of advice, recommendation or arrangement by EmCan and is not intended to be relied upon by users in making (or refraining from making) any specific decisions. Any arrangements made between you and any third party named on the Sites are at your sole risk and responsibility. Because of the number of sources from which EmCan obtains Content and nature of electronic distribution via the internet, EmCan does not give any warranties in respect of the Sites, Content, software or services available through the Sites (collectively, "Site Services"). In particular, the Site Services are provided on an "as is" basis. To the extent allowed by applicable law, EmCan hereby disclaims all warranties, conditions or duties of every nature whatsoever (except any duties of good faith), including without limitation, any implied warranties of merchantability of fitness for a particular purpose, any express or statutory warranties, and any warranties or duties regarding accuracy or timeliness. In addition, EmCan makes no warranty that the Site Services are free from infection by viruses or anything else that has contaminating or destructive properties. To the fullest extent allowed by applicable law, you agree that EmCan will not be liable to you and/or any third party for any consequential or incidental damages (including but not limited to lost profits, loss of privacy or for failure to meet any duty including but not limited to any duty of good faith or for any other indirect, special, or punitive damages whatsoever) that arise out of or in connection with the Site Services or any breach of these terms by EmCan, even if EmCan has been advised of the possibility of such damages. The Sites contains links to the other websites provided by independent third parties ("Third Party Sites"), either directly or through frames. Where possible, EmCan will make clear such links are being made, although Third Party Sites may be co-branded with EmCan and so include EmCan 's trademarks. EmCan is not responsible for the availability or content of Third Party Sites and will not be a party to, or in any way responsible for, any transaction concerning goods or services available from such Third Party Sites. Notwithstanding the provisions of this section, EmCan 's liabilities will not be limited in the case of death or personal injury directly caused by EmCan 's negligence. EmCan reserves the right, at its discretion, to make changes to any part of the Sites or these terms. When these terms are changed, EmCan will publish details of the new terms as updated from time to time. By using the Sites, you are agreeing now to be bound by those changes and revised terms. Part of the Sites may contain advertising and sponsorship. Advertisers and sponsors are responsible for ensuring that material submitted for inclusion on the Sites complies with applicable law and regulation. EmCan will not be responsible for any error or inaccuracy in advertising material. These terms shall be governed by, and construed in accordance with, Spanish Law. You irrevocably agree that the courts of Spain shall have exclusive jurisdiction to settle any dispute which may arise out of, under, or in connection with these terms or the legal relationship established by them, and for those purposes irrevocably submit all disputes to the jurisdiction of the Spanish courts. For the exclusive benefit of EmCan, EmCan retains the right to bring proceedings as to the substance of the matter in the courts of the country of your residence or, where these terms are entered into the course of your trade or profession, the country of your principal place of business. You may not assign, sub-license or otherwise transfer any of the rights under these terms. If any term is found to be invalid by any court having competent jurisdiction, the invalidity of that provision will not effect the validity of the remaining provisions of these terms, which shall remain in full force and effect. Failure by either party to exercise any right or remedy under these terms does not constitute a waiver of that right or remedy. Headings in these terms are for convenience only and will have no legal meaning or effect. 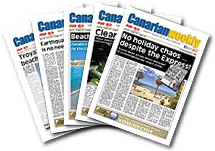 EmCan Media is a company registered in Spain as Emisora Canaria SL under CIF number B-38625133 whose registered office is at Poligono Industrial 65, Bloque 2-B, 38620 San Miguel De Abona, Tenerife.